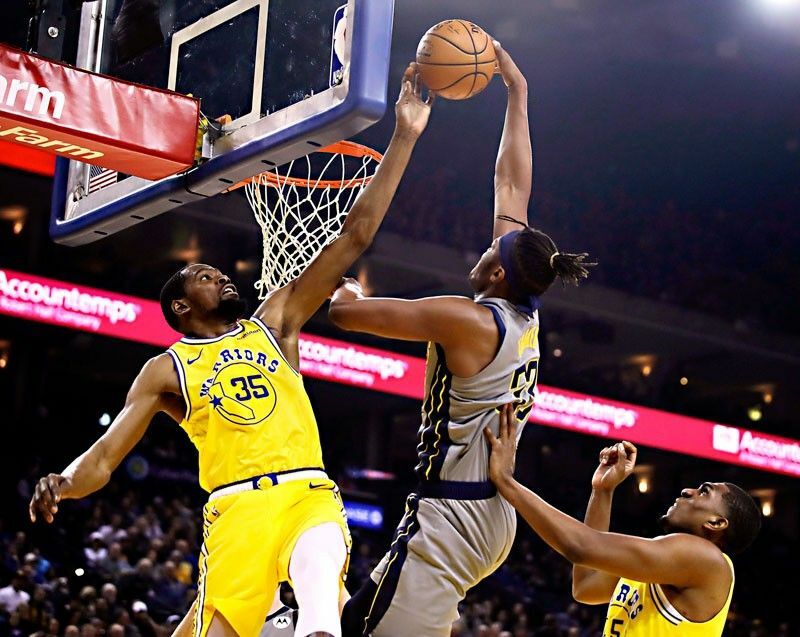 Golden State Warriors’ Kevin Durant (left) blocks a shot from Indiana Pacers’ Myles Turner during the first half in Oakland, California. OAKLAND, California – Kevin Durant had 15 points, six assists and three blocked shots after losing a close friend earlier in the day, and Golden State ran away from Indiana 112-89. In Atlanta, Trae Young scored 23 points, including a go-ahead three-point play, and Atlanta ended Utah’s five-game winning streak with a 117-114 victory. In Washington, Nikola Jokic had 15 points and 11 assists, and the Denver Nuggets beat the fading Washington Wizards 113-108 on Thursday night for their fifth straight victory. In Phoenix, Wayne Ellington scored 23 points and Detroit made 17 3-pointers in a 118-98 victory over Phoenix. In Charlotte, Kemba Walker scored 31 points, rookie Miles Bridges had 11 points and 12 rebounds for his first career double-double on his 21st birthday, and Charlotte handed Minnesota its fifth straight loss. In Sacramento, Marvin Bagley III had 22 points and 12 rebounds in his first game against fellow rookie star Luka Doncic, and Sacramento beat Dallas.